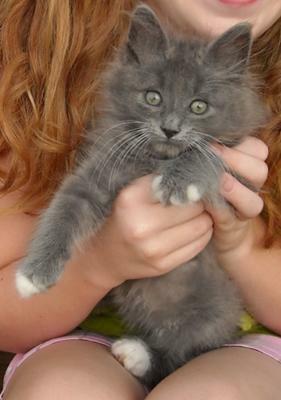 Brillo is a fluffy, white pawed, and gray kitten. He is always lovable, sweet, and playful. I actually got to see him be born. With his four solid black sisters, black and white mother, and solid black father, he was the only gray kitten (and only fluffy kitten) out of the bunch. His favorite thing to do is to play. He doesn't take lots of naps like any other cat or kitten. When everyone see's him they have to brag. Mostly, I'll find him in the shade sitting there, but as soon as I go meow, he gets up and runs to me. I gave his mother and four sisters away. So, he learned how to be playful and sweet by me. Brillo is so cute, that someone actually asked me if they could have him. He really never meows, unless he gets hurt. I always take care of him, by feeding him, playing with him, talking to him, and lots of other things. So, if I could pick one kitten in the world it would be Brillo! Wow… He is really a beautiful one and he looks more like some soft toy than a live cat. Which breed is he? The color is so rare, I guess and that is what actually is making him look so adorable. That is okay. Even though Brillo didn't win, I am very proud of him. Puss is a cute kitten too. Well thanks again! Yes, the winner has been declared. Unfortunately, although he is very cute and came close, I'm sorry to say that Brillo did not win. I've posted the winner, Puss, at the Cute Cats page. Thanks for entering! Did they choose a winner yet? Cause I have been waiting a while to know. Thanks! I was going to let this conversation play out, but let's clear something up. You may comment and rate all you wish, either on other entries or your own. The rules of the contest do not prohibit this, and it won't directly affect the outcome. Yes, "rate this page" is subject to interpretation. In an effort to keep things simple, I didn't put anything in the contest rules to explain that because, as I stated above, it won't affect judging. Comment away. I was unaware this rating was for my kitty. I do apologize, I thought it said, "Rate this Page". I guess "Rate this Page" can be left to interpretation. I am not offended, just a proud cat owner. I love my kitty! I watched him be born, and have taken care of him ever since. He may just be a cat to anyone else, but to me, he's a VERY special kitty. I'm no holds bar, when it comes to Brillo. And if I did something wrong, it was truly unintentional. As for those of you who left comments, thanks! Oh, sorry! I will try to stop. I do appreciate that you told me! You can also find it on Bing and Yahoo...and thanks for all your comments...Brillo will appreciate it! And so will I....keep leaving more, and dream big! Love Lovable Brillo and me. I started a cat website....check it out! I started a website on cats. It is called kittyparadise.webs.com. You may have to look it up on google. I may also have to know your email if you can't find it. Tell me if you were able to find it or not. And thank you for all your votes! They were wonderful! Brillo knows how to pose for the camera. We have many more photo's of him. Also when I come down the hall, he'll jump out at the corner like he's going to get you. I have something to brighten your day, or make you laugh. If you something gray or fluffy that jumps out and gets you... you know it's Brillo! Thanks Cat FAN! He does have lots of personality! So playful....he would never bite! Thanks! OH, how adorable this kitty is. His cute little face is full of character and personality! I can see why you named him Brillo! He looks like a brillo pad with eyes! Thank all of you for voting! Thanks for voting! Keep leaving more comments as well! I have something to brighten your day, It's a Brillo, it's a cat, it's a Brillo cat! Enjoy! Yes I do think so, too! Thank you so much! Brillo does know how to model for the camera! Love your story of Brillo ! SO SO SO cyoot ! Very photogenic, don't you think ? He's a Brillo, he's a cat, he's a brillo cat! Thank you Sophie! Your daughter and your cat was cute together. What a precious, precious, ADORABLE kitty! His name "Brillo" is too cute!!!!!! Brillo is also very good around children. He never bit, or scratched. I am going to pray about that I do good on the contest. You just do the same. Good Luck! Brillo is known as "the cutest." Everyone that see's him says, Oh my goodness! He's so cute! Brillo would NEVER scratch, or hurt you. He would just put his paw's around you, and bite it (not even feeling him bite, and he has his pawls around me with NO claws out!) Sometimes, I would see a Persian or a Himalayan. But, he is cuter than those!